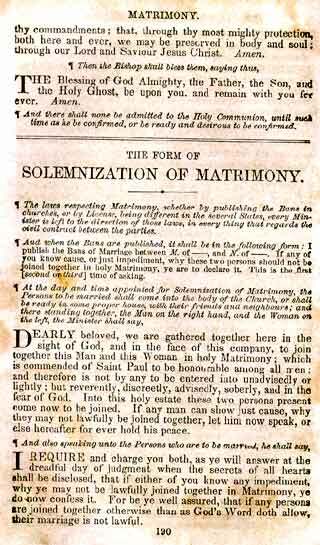 ¶ The laws respecting Matrimony, whether by publishing the Banns in churches, or by License, being different in the several States, every Minister is left to the direction of those laws, in every thing that regards the civil contract between the parties. ¶ And when the Banns are published, it shall be in the following form: I publish the Banns of Marriage between M. of ----, and N. of ----. If any of you know cause or just impediment, why these two persons should not be joined together in holy Matrimony, ye are to declare it. This is the first [second or third] time of asking. These two rubrics printed as one until 1822. DEARLY beloved, we are gathered together here in the sight of God, and in the face of this company, to join together this Man and this Woman in holy Matrimony; which is [an honourable estate, instituted of God in the time of mans innocency, signifying unto us the mystical union that is betwixt Christ and his Church: which holy estate Christ adorned and beautified with his presence and first miracle that he wrought in Cana of Galilee, and is]* commended of Saint Paul to be honourable among all men: and therefore is not by any to be entered into unadvisedly or lightly; but reverently, discreetly, advisedly, soberly, and in the fear of God. Into this holy estate these two persons present come now to be joined. If any man can show just cause, why they may not lawfully be joined together, let him now speak, or else hereafter for ever hold his peace. * This section added in the 1892 BCP. 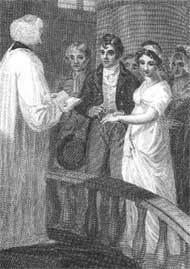 I REQUIRE and charge you both, (as ye will answer at the dreadful day of judgment when the secrets of all hearts shall be disclosed), that if either of you know any impediment why ye may not be lawfully joined together in Matrimony, ye do now confess it. For be ye well assured, that if any persons are joined together otherwise than as God's Word doth allow, their marriage is not lawful. M. WILT thou have this Woman to thy wedded wife, to live together after God's ordinance in the holy estate of Matrimony? Wilt thou love her, comfort her honour and keep her in sickness and in health; and, forsaking all others, keep thee only unto her, so long as ye both shall live? N. WILT thou have this Man to thy wedded husband, to live together after Gods ordinance in the holy estate of Matrimony? Wilt thou obey him, and serve him, love, honour, and keep him in sickness and in health; and, forsaking all others, keep thee only unto him, so long as ye both shall live? ¶ Then shall they give their troth to each other in this manner. The Minister, receiving the Woman at her father's or friend's hands, shall cause the Man with his right hand to take the Woman by her right hand, and to say after him as followeth. I M. take thee N. to my wedded wife, to have and to hold from this day forward, for better for worse, for richer for poorer, in sickness and in health, to love and to cherish, till death us do part, according to God's holy ordinance; and thereto I plight thee my troth. I N. take thee M. to my wedded husband, to have and to hold, from this day forward, for better for worse, for richer for poorer, in sickness and in health, to love, cherish, and obey, till death us do part, according to God's holy ordinance; and thereto I give thee my troth. WITH this Ring I thee wed, and with all my worldly goods I thee endow: In the Name of the Father, and of the Son, and of the Holy Ghost. Amen. This rubric Printed as two rubrics until 1845. 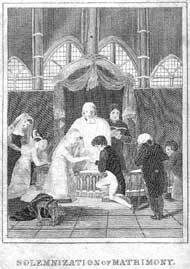 Marriage ceremony, from an 1810 English Book of Common Prayer. OUR Father who art in heaven, Hallowed be thy Name. Thy kingdom come. Thy will be done on earth, As it is in heaven. Give us this day our daily bread. And forgive us our trespasses, As we forgive those who trespass against us. And lead us not into temptation; But deliver us from evil. Amen. O ETERNAL God, Creator and Preserver of all mankind, Giver of all spiritual grace, the Author of everlasting life; Send thy blessing upon these thy servants, this man and this woman, whom we bless in thy Name; that, as Isaac and Rebecca lived faithfully together, so these persons may surely perform and keep the vow and covenant betwixt them made, (whereof this Ring given and received is a token and pledge,) and may ever remain in perfect love and peace together, and live according to thy laws; through Jesus Christ our Lord. Amen. FORASMUCH as M. and N. have consented together in holy wedlock, and have witnessed the same before God and this company, and thereto have given and pledged their troth, each to the other, and have declared the same by giving and receiving a Ring, and by joining hands; I pronounce that they are Man and Wife, In the Name of the Father, and of the Son, and of the Holy Ghost. Amen.